Early in the morning as the camp's fire spews forth smoke from the dying embers and while the hunters are sitting their stands in the deep woods, hoping that a Trophy Buck will soon come into view and make productive their opening day hunt. 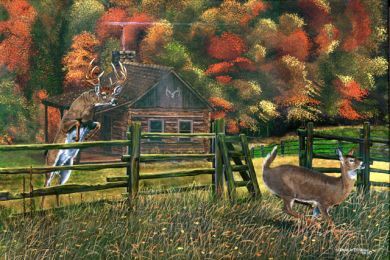 While they sit and dream, a Trophy Buck chases a Hot doe right across the front yard and over the old wooden split rail fence that surrounds their cabin. Size 28.75 x 14.25 (paper) with ample border.